Whenever I'm on the road, I usually do some research about good local whisk(e)y bars. But this time we happily happened into one thanks to our friends Gabe and Leigh. 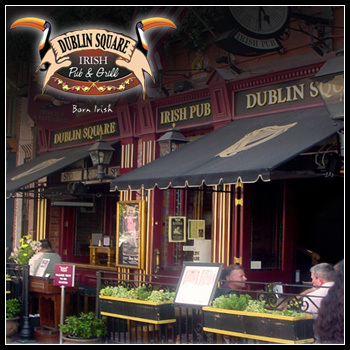 Dublin Square in San Diego has a nice Scotch assortment and a GREAT Irish Whiskey selection. 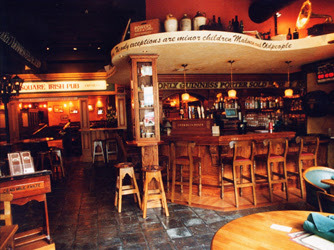 It's a nice wood-walled little pub that gets considerably better once the live Irish traditional music kicks in. They play local sports as well as soccer, rugby, and cricket on their half dozen TVs. Here's their super drinks menu. Dive in. Not many places post their booze online. On night #1, I went with Glenkinchie 10yr. "Ten-year?" you ask. "I thought they only had a 12yr and 20yr, officially!" That is true. But Diageo (curses!) used to release a 10yr. They last bottled it in 2006. It's not terribly dissimilar to the 12yr, previously reported on here. Though the six years in the bottle haven't been terribly complimentary to the malt, it's very drinkable. It has a bit more bite than the 12, likely due to its youth. It's very spirity, with less oak effect. Still fresh, floral, lightly fruity, and mild. It's better than most blends, but not better than most single malts its age. On night #2, I went with the Powers 12yr and Slane Castle blends. Thought it was proper since we were in an Irish pub and all. I'll be doing full reports on those two in the relatively near future.